Ocean front Condo-Come stay in this beautiful ocean front two bedroom condominium located directly on the beach in Saint Augustine just 4.5 miles from historic Saint Augustine. This is a two story condo with a fabulous ocean view from your private balcony in the master bedroom! Wifi, HBO, cable is offered at no additional charge. The 1st floor of the condo features attached garage with full size washer and dryer, a spacious living room with 42' flat screen TV, leather couch and wicker rockers, dining area with table that sits six, fully-equipped kitchen with new appliances and full bathroom, a private patio to enjoy the ocean sounds. The second floor of the condo features the 2nd full bathroom, the master bedroom which offers a king-sized bed, with an extra large closet, and a private balcony equipped with chairs and table to enjoy the ocean view with your morning coffee. The second bedroom has a queen size and a twin size bed and sun deck overlooking the pool and parking area. All towels and linens are furnished. 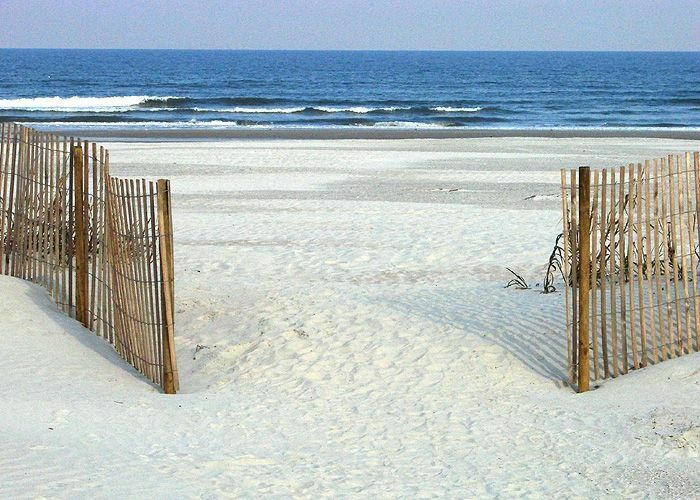 Vacation Rental Amenities: Direct Ocean front and private boardwalk access to the beach. Full Kitchen, Dining Area (sits 6) Microwave, Dishwasher, Refrigerator, Ice Maker, Coffee maker, blender, toaster, etc. Linens (provided), Local Property Manager. All linens provided including beach towels. Enjoy the sounds of the waves and the ocean view from the master bedroom balcony. Nearby kayak and canoe rental at Anastasia State Park. Two swimming pools, one is heated. New Appliances- Glass top Range/Oven and Dishwasher. 42'' flat screen TV in living room and flat screen TV/DVD Combo in both bedrooms. New furniture in master bedroom including a king size bed. Very well maintained condo. Beautiful condo with great views. Nice decor, comfortable furniture, and terrific beds. It is close to Sunset Grill, St. Augustine sites, and grocery stores. The garage is an added bonus! We would definitely return. Thanks to the Riley's for allowing us to use their lovely condo! Thank you for taking the time to write a review. We are so glad you enjoyed your stay and we hope to host you stein soon. We usually stay on the Gulf side of FL but since we had visited old St Augustine a couple of times, we wanted to experience the beach side. Condo was clean & efficient but what a smell! At first, we were unsure if we could or would stay there. Whether it was a solvent on the rugs or a pesticide or a dead animal in the walls, we will never know. I had to open all the windows & doors and spray to try to alleviate the situation. By the end of our stay, the smell was either gone or we had got used to it. The only view of the ocean is from the second floor master bedroom balcony. I understand that the dunes are there & are important. When building, they should have put garage on ground floor with the other 2 floors above it, so once inside, the ocean was visible. The surf was full of bubbles/foam. I don't think we'll be back to St Augustine beach again. Thank you for taking the time to write a review. I wanted to let you know that we had just renovated the upstairs bathroom with porcelain tile, soft close vanity, granite, new plumbing fixtures, lighting, mirror, removed the carpet in both bedrooms and replaced with porcelain wood-look tile. New carpet on the stairwell and fresh paint. The remodeling was complete just before Thanksgiving, so when you arrived on Saturday, perhaps that was the smell you were referring to. We really go out of our way and spare no expense to make sure our condo is very well maintained and presentable. This is our vacation home too, and we want it enjoyable for our family as well as yours. The ad accurately explains that this is an oceanfront condo. You are ten steps away from the boardwalk leading to the ocean. From the downstairs patio you can enjoy the ocean sounds, however, the ocean view is from the upstairs master bedroom balcony. You are the first guest to speak negatively about the Atlantic Ocean. Sometimes mother nature does have foam in the water. As I am sure when you visit the west coast, you have experienced "Red Tide" in the Gulf of Mexico. We love St. Augustine with its quant European historic district, and the awesome waves of the Atlantic Ocean when staying on the Beach. We have many returning guests, and we hope you will consider visiting again in the near future. The place was perfect. Bathrooms were remodeled and beautiful. Kitchen had everything we needed. The location was absolutely perfect. We will definitely be back. We loved this home! Perfect location, distance to beach and restaurants, stores. Waking up to the view from the balcony every morning was amazing. Walking 5 minutes to the beach was great. The house is truly equipped with everything needed for a few days stay. It is an old subdivision, but the grounds, pool, and walkways are kept in great shape. The AC broke down while we were there and it was fixed literally the next morning. The technician did not leave until he made sure it was working perfectly; so wonderful! Having a garage was a plus too! The picture you see when you first look this property up is real. That is what my family enjoyed for 5 wonderful days. We will certainly be coming back! Thanks Susan and Mitch for allowing us to enjoy your home. Thank you for taking the time to write such a great review. We love to hear that you enjoyed your vacation, and we look forward to hosting you again next year. We never really spent much time in the unit because it is so close to everything we had no need to sit inside. We spent most of our time on the beach and thankfully the unit had everything we needed to enjoy our time out there. I was able to find everything I needed in the unit and cant think of anything it was missing. It was a great vacation! My husband loved the master bed and decided he wants one at home just like it! Thank you for your review. We are so glad you had an awesome vacation. We look forward to having you again on your next trip to St. Augustine. Fantastic Condo, Beach & Location!!! We loved our stay in St. Augustine. We were visiting family in Jacksonville, but wanted to have some couple time too, so we decided upon St. Augustine. The condo was perfect, it had everything we needed, and when they say directly on the beach they mean it! The beach is wonderful, and I could swear it was private, everytime we went out, there were only a few people out there. We also went to the pool multiple times, which again felt private, not many people use it. But there are plenty of chairs and everything is clean and kept up. The condo really was perfect, and it has everything from beach chairs and towels, to pots & pans and even spices. We don't have kids, but we saw plenty of tools for sandcastle building and even some boogie boards. I will miss the upstairs shower, the water pressure is amazing! Also loved the fact that it had a full washer and dryer, for extended vacations it comes in handy. There are a bunch of little restaurants near the condo, but downtown St. Augustine is only 10mins away, and a cab/uber is less than $10 if you feel like having a few drinks without worrying about driving. Downtown St. Augustine is gorgeous. You feel like you've stepped into an European town. There are a bunch of fun shops, restaurants and bars to explore, we were there for 2 weeks and still didn't get to visit everything we wanted to see. From Jacksonville, the condo is about 40 minutes away, so that was perfect for us. We could enjoy the beach in the mornings, see family in the afternoons, and be in downtown St. Augustine at night. We could not recommend this place more and we are planning on renting here again the next time we are in the area. Thank you for such a great review. We look forward to having you as a guest again the next tine you are in town. Please note cleaning fee increases from $85 to $150 if you are staying one month or longer. No refunds for any bookings, we strongly encourage travelers to obtain travelers insurance.